In the face of the challenges of climate change, energy security, economic growth and a growing divestment movement, the future of the energy fuel mix and the health of the planet seem inextricably linked. This article by our intern Amy Elliott discusses what can be expected in the future. So what can be expected for the future? BP’s 2035 Energy Outlook released last year appears to reflect a business as usual perspective. Slight changes occur in the proportion of natural gas to coal production, with the energy produced from gas growing in proportion to coal. As gas produces about half the carbon per kilowatt hour of energy compared to coal, this appears to be a positive change from a climate change perspective. However, this is overshadowed by the prediction that carbon emissions will continue to increase over the coming decades, and will quickly exceed the 900GtCO2 carbon budget for an 80% chance of not exceeding a 2°C global temperature increase. 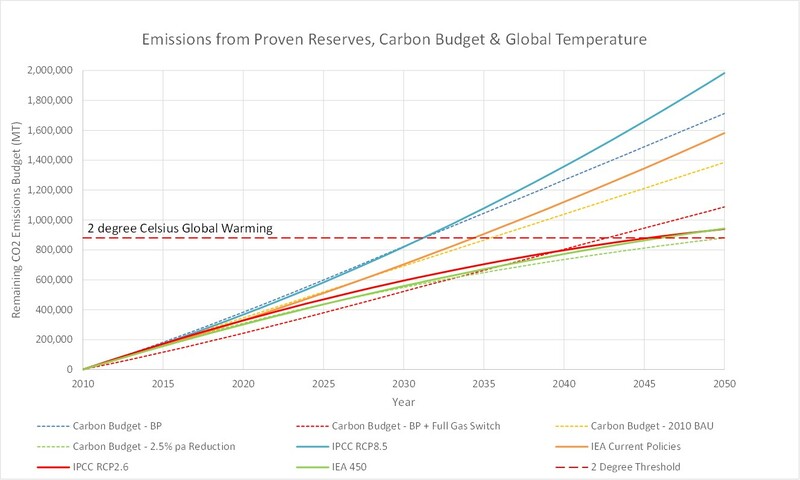 When considering that the total amount of potential carbon emissions from known fossil fuel reserves exceeds 2860GtCO2, three times that of the budget above (fig 1), it becomes apparent that continued fossil fuel production and short term economic benefit, is currently prevailing over environmental sustainability and longer term economic stability. It is important to note that this is not a battle of business versus environment or, as some see, tree huggers and radicals versus modern prosperity and economic development. This argument is simply not valid, as explained by the widely accepted and well-regarded 700-page report by economist Nicholas Stern, titled ‘The Stern Review’. Here, the economic cost of climate change and also the economic cost of preventing climate change is quantified. Stern’s results are profound: in summary, without action, the overall costs of climate change will be equivalent to losing at least 5% of global GDP each year, now and forever. Including a wider range of risks and impacts could increase this to 20% of GDP or more, also indefinitely. This is due to the adverse affects on food supply, access to water, health, and land use that climate change would cause. No, this is a matter of business as usual in the fossil fuel industry, versus the political and public willpower to overcome short term challenges and create a long term economically and environmentally sustainable planet. Where are we realistically heading? BP’s report indicates an assumption that governments are not going to enforce climate change regulations to the extent that assets will become stranded. This perspective is also currently reflected in global stock exchanges, whose level of embedded carbon increased by 37% from 2011 to 2013. In 2013, the amount of total carbon emissions of listed current reserves of fossil fuels from Moscow, London and New York stock exchanges was 144, 113, and 215 GtCO2respectively, and this excludes any potential or further reserves. A 2013 Carbon Tracker report estimates that the top 200 oil and gas and mining companies have allocated up to $674bn in 2013 for finding and developing more reserves and new ways of extracting them. At this rate of capital expenditure, the next decade will see over $6tn being allocated to developing fossil fuels; fossil fuels that simply cannot be burned if we are to stay within the 2°C temperature target and avoid the catastrophic economic and environmental effects of climate change. The implication of the state of public and private investment in regards to fossil fuels is massive. As large fossil fuel companies invest in exploration and continue to add to their reserves and as smaller companies issue IPO’s to raise capital for doing the same, the logic of increasing reserves has to be questioned. Despite this, companies are being valued on the assumption that carbon regulations will not be implemented. Indeed, one of the key indices in valuing fossil fuel companies is the reserve-replacement ratio, which is a measure of reserves being added to the books in proportion to those being burned. The 200 publically-listed fossil fuel companies analyzed by the 2013 Carbon Tracker report had a valuation of $4tn, with $1.5tn of debt (74% of which was for oil and gas companies, and 26% for coal). HSBC reported that equity valuations could be reduced by 40-60% in a low emissions scenario. A Kepler Cheuvreux analyst, Mark Lewis, estimates that a two-degree pathway would mean $28trn in revenue losses for oil, coal and gas companies over the next two decades. This is due to the fact that more than 50% of the value of an oil and gas company resides in the value of cash flows to be generated in year 11 onwards (as reported by McKinsey and the Carbon Trust). The paradox that exists is that the valuations of companies is currently being based on assets that will become stranded before a decade is over if the world wants to take action on climate change. Indeed, some question whether the reserve-replacement ratio could become the reserve-redundancy ratio. To demonstrate the extent to which future production accounts towards company valuation, in 2004, Shell announced that their proven oil reserves had been overestimated by 20%, by the following month their share price had fallen by 15% and £3bn had been wiped from its value. As shown, this spells losses for mining companies and the oil and gas sector, but it is absolutely essential that all parties involved accept that this is a necessary transition in order to preserve the health of the planet and avoid the catastrophic effects of climate change, that would lead to economic losses that far exceed the losses associated with stranded fossil fuel assets. The way that this transition is addressed and managed is crucial. The Carbon Tracker predicts a ‘carbon bubble burst’, similar to the crash experienced by the Global Financial Crisis (GFC) that was triggered by a similar bubble in housing prices. Unlike the GFC however, the carbon bubble burst relies on implementation of regulation from governments, among other factors, to instigate the losses. Looking to the future: what can we do? As we look to the future, there are many paths that have still to be explored. However, an undeniable key milestone in the course of climate change action is the United Nations Climate Change Conference in Paris in December this year. The CDC Climat outlined three main objectives of the conference: to improve the Monitoring, Reporting and Verification of emissions, to make low carbon technology competitive, and to finance the transition to a low carbon economy. There are many potential solutions that have been explored and partially developed, with limited success (the EU ETS comes to mind). From here out, we will explore the feasibility of a similar tax system – essentially one that works to put a price on carbon and incentivize global participation. A scheme such as that would spell a successful outcome for Paris – one that works to incentivize, rather than enforce, global agreement and participation. A possible solution is for most of the countries at the UNCCC Paris to agree to implement a carbon tax system internationally. Setting a common global price on carbon has the potential to fundamentally change the climate change debate. Countries which implement the carbon tax would all be equally advantaged/disadvantaged. Goods and carbon products imported from a country which did not apply a carbon tax would be taxed on import; a carbon-import tariff. The revenues collected from carbon tax and from the carbon-import tariff would be dedicated to climate mitigation efforts. An issue often raised when talking about tariffs, is making carbon-taxed products competitive. In the above scheme, this issue is eliminated since the product will either be taxed in country or at the point of import, so prices are levelised. This scheme would incentivize exporting countries to adopt a carbon tax, to avoid the import tariff benefit going to the importing country, something that has proven difficult in the past due to a lack of international standardization and competitiveness. Here is where the UNCCC in Paris has the opportunity to make its first crucial impact – to come to a widespread agreement on the price, which has so far remained an illusive goal. As a teenager myself, I look towards the future and wonder how we can possibly engage people, political parties, governments and institutions, towards action that would limit fossil fuel emissions and limit climate change to 2°C. But then I remember that amongst this chaos is opportunity – we, as a planet, have a ladder to climb. When addressing such an energy transition, it is imperative to recognise that clinging to the illusions of short-term success and stability will lead us to long-term failure on all accounts. It is time to move beyond our fossil fuel past and drive an effective transition to a low carbon future, even if it results in some assets being stranded. Amy Elliott was an intern at Pale Blue Dot Energy in the UK during January 2015. She is currently studying at the University Of Queensland, Australia. Amy is passionate about energy related matters and the need to address climate change. Amy also wrote the paper Fossil Fuel Divestment: What Will It Achieve?